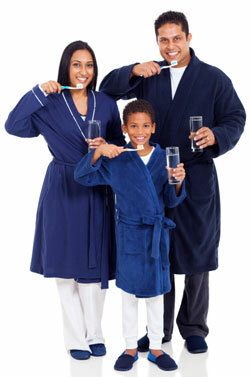 Call us if you have any questions about good oral hygiene. The key to proper plaque control is investing the right amount of time to your oral hygiene. Dr. Abufaris suggests the following methods. Place toothbrush at the gumline at a 45-degree angle. Use short back and forth strokes. Brush 2 to 3 teeth at a time, always concentrating on “gumline brushing”. Ease floss in between the contacts of the teeth. 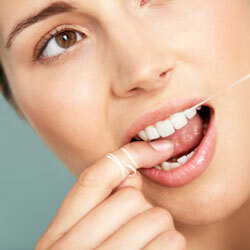 Wrap floss in a c-shape around the sides of the teeth. Slide the floss below the gumline until you meet resistance. Move the floss up and down with both fingers on the side of one tooth, and then repeat on the side of the other tooth, until the surfaces are "squeaky” clean. Use this brush in conjunction with flossing, for the areas that have spaces in between the teeth. Place the brush in the space at the gumline and brush back and forth, cleaning the surface of the tooth thoroughly. Do this motion coming from both tongue side and cheek side. The backs of the last molars. Spaces where there are missing teeth. Backside of the front teeth. In difficult areas along the gumline, where the toothbrush cannot reach. Place the tip in between the teeth at the gumline and press gently using a massaging motion. This stimulates and helps strengthen the gum tissue. Use from both tongue and cheek side. This is used to reveal the invisible plaque by staining it red. Place one tablet in a small cup of warm water and let the tablet completely dissolve. Swish the contents of cup for 2 minutes. The disclosing tablet presents the true plaque picture. If you have any questions involving the above, please do not hesitate to give us a call.